Southern senior Garrett Wolfe (24) fends off Rebels Austin Stapleton (left) and Jacob Birtcher (right), during the Tornadoes’ 48-0 victory on Friday in Mercerville, Ohio. 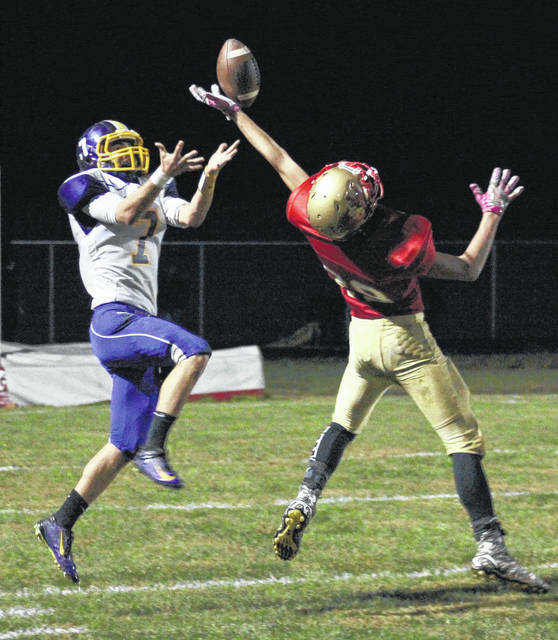 South Gallia freshman Wade Hicks (right) knocks a pass away from Southern senior Dylan Smith (7), during the Tornadoes’ 48-0 win on Friday in Mercerville, Ohio. 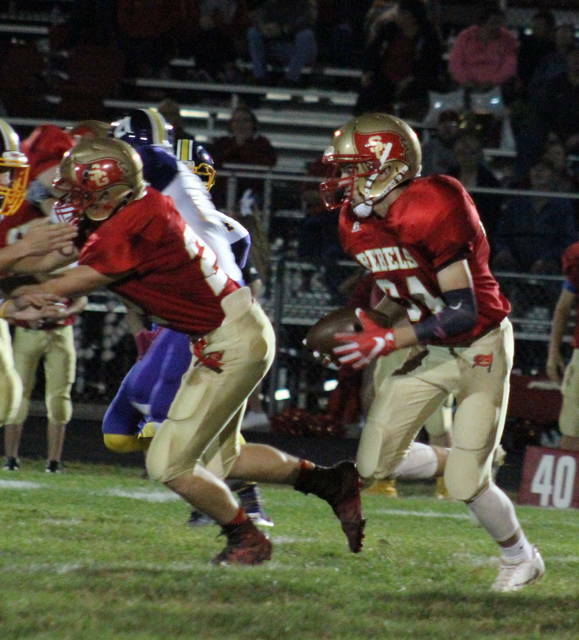 MERCERVILLE, Ohio — It’s hard to say which was better on Friday, the Tornadoes’ offense or their defense. 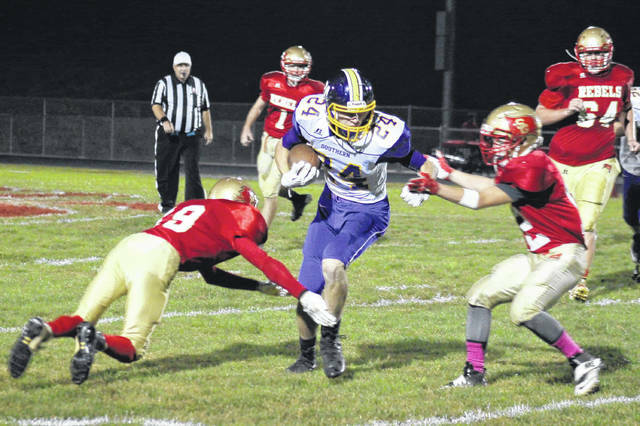 Either way, the Southern football team had a memorable night on the gridiron, as the Tornadoes found the endzone seven times and stormed to a 48-0 victory over Tri-Valley Conference Hocking Division host South Gallia. The Rebels (2-7, 1-6 TVC Hocking) — who never advanced beyond the SHS 30-yard line in the game — gained a pair of first downs on the game’s opening possession, but a pair of penalties stalled the drive. South Gallia’s punt attempt failed, giving Southern (6-3, 4-3) the ball with just 36 yards to paydirt. On the fourth play of the ensuing drive, SHS senior Riley Roush scored the game’s first touchdown on a 15-yard run. Andrew Evans made his first of six extra-point kicks in the win, giving the guests a 7-0 edge with 6:36 left in the opening quarter. Following a Rebel three-and-out, Southern’s offense took over for its second drive at the its own 32. Roush began the drive with a 32-yard run, and ended the possession six plays later a three-yard touchdown run. Evans’ extra-point gave the guests a 14-0 advantage with 1:48 left in the first period. South Gallia went three-and-out again, but the Rebel defense stood tall on the ensuing Tornado possession, forcing a turnover on downs after just four plays. However, South Gallia fumbled the ball away on its next drive, giving SHS the ball back at midfield. Penalties back Southern up into its own territory, but it didn’t matter, as Austin Baker hauled in a 63-yard scoring pass from Logan Drummer. Evans’ extra-point kick gave the guests a 21-0 lead with 9:09 remaining in the first half. South Gallia went three-and-out again, punting the ball back to Southern, which made it all the way to the SGHS 35 on the return. On the fourth play of the Tornado possession, Roush broke a 20-yard scoring run that, with Evans’ point-after, gave SHS a 28-0 lead at the 6:02 mark of the second quarter. After picking up their fourth first down of the opening half and moving to the SHS 40, South Gallia was backed up five yards and prepared to punt. The snap went over the punter’s head again, and this time Evans came up with the loose ball for the Purple and Gold at the SGHS 31. After a 21-yard pass from Dylan Smith to Garrett Wolfe and a SGHS personal foul, Smith found paydirt on a five-yard run, pushing the Tornado lead to 34-0 with 2:45 left in the half. The Tornadoes opened the second half with a nine-play, 58-yard drive, that was capped off by a three-yard touchdown run by Gage Shuler. Evans’ extra-point gave Southern a 41-0 lead with 6:13 left in the third period. South Gallia’s offense moved the ball 26 yards on the ensuing drive, but on the ninth play, SHS junior Alex VanMeter intercepted a pass and returned it 62 yards for the touchdown. Evan’s extra-point kick was the final marker of the Tornadoes’ 48-0 victory. For the game, Southern held a 14-to-7 advantage in first downs and a 326-to-90 edge in total offense. The Tornadoes earned a 3-0 win in the turnover battle, while both teams were penalized seven times, with the guests losing 50 yards and South Gallia backing up 43 yards. The Southern offense was led by Roush with 125 yards and three touchdowns on 11 carries. Dylan Smith rushed for 53 yards and one score on six carries, while completing his only pass attempt for 21 yards. Shuler had 25 yards and one score on four carries, Reece Reuter added 17 yards on four totes, while Gage Barrett had 14 yards on a quartet of tries. Weston Thorla added two yards on one carry, rounding out the category for the guests. Drummer completed 2-of-5 pass attempts for 69 yards and one score. Baker had one 63-yard touchdown grab, while Wolfe hauled in two passes for a total of 27 yards. 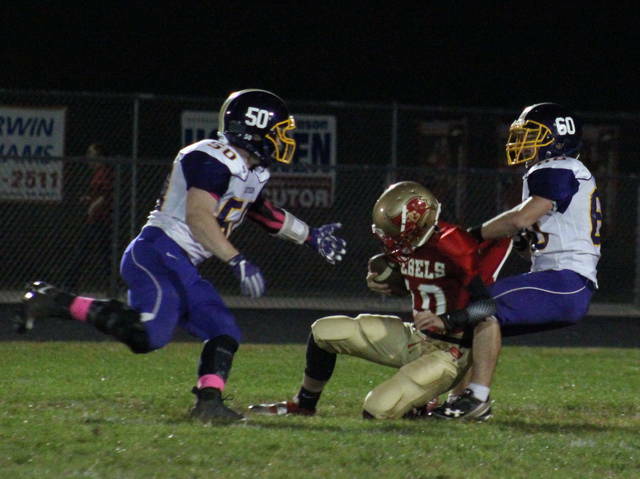 VanMeter led the Purple and Gold defensively with an interception and four tackles for a loss. SGHS sophomore Kyle Northup led the way for the hosts, earning 62 yards on 18 carries. Gavin Bevan was next with 27 yards on six tries, while Jacob Birtcher added 22 yards on 11 totes. Jaxin Mabe completed 1-of-2 pass attempts, finding Austin Stapleton for a 12-yard play. SHS improves to 12-9 against SGHS in all-time meetings, including two straight. Prior to the game, South Gallia honored its seniors, playing at home for the final time. The three SGHS seniors are Tyler Bryan, Chayce Pearson and Colton Bowers. South Gallia will wrap up its 2017 campaign at Miller on Friday. Southern will have an extra day of rest before hosting Eastern in its regular season finale on Saturday.